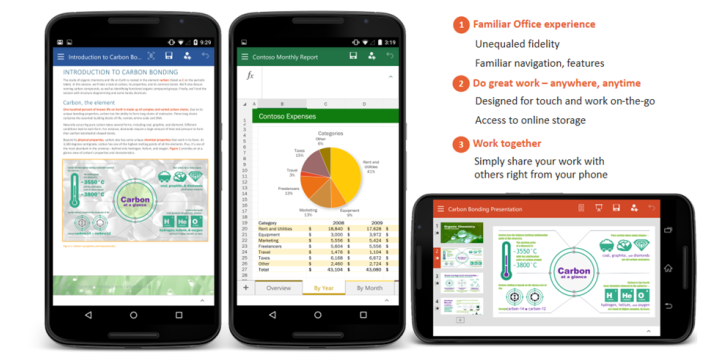 Earlier today, Microsoft released preview versions of its modern Office apps for Android smartphones. In order to try out the preview versions of Word, Excel and PowerPoint on your Android phone, you will first have to sign up as a Beta user. Although Apple's iOS was the first non-Windows mobile operating system to get modern Office apps, it looks like Microsoft was no longer willing to ignore the huge market share commanded by Google's Android. Back in November 2014, Microsoft launched preview Office apps for Android tablets, proceeding to launch full versions back in late January 2015. Up until today, Microsoft did not offer an up-to-date method of viewing and editing Office documents for Android smartphones. Users have had to rely on Office Mobile, which doesn't offer the same level of usability as the iPhone version. Once the new Office apps for Android smartphones go out of preview and apps are ready for mass distribution, they will replace Office Mobile. The new Office apps share a lot of similarities with the Android tablet version of Office, allowing users to create, open and edit Word, Excel and PowerPoint documents on their device or on the cloud. All three apps are compatible with handsets running Android 4.4 KitKat or higher.